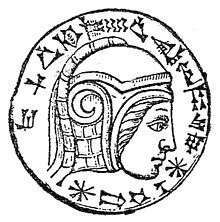 An engraving on an eye stone of onyx with an inscription of Nebuchadnezzar II. Anton Nyström, 1901. Nebuchadnezzar II ( i/ˌnɛbjᵿkədˈnɛzər/; Aramaic: ܢܵܒܘܼ ܟܘܼܕܘܼܪܝܼ ܐܘܼܨܘܼܪ ‎‎; Hebrew: נְבוּכַדְנֶצַּר‎ Nəḇūḵaḏneṣṣar; Ancient Greek: Ναβουχοδονόσωρ Naboukhodonósôr; Latin: Nabuchodonosor; Arabic: نِبُوخَذنِصَّر nibūḫaḏniṣṣar; c. 634 – c. 562 BC) was a Chaldean king of the Neo-Babylonian Empire, who reigned c. 605 BC – c. 562 BC. Both the construction of the Hanging Gardens of Babylon and the destruction of Jerusalem's temple are ascribed to him. He is featured in the Book of Daniel and is mentioned in several other books of the Bible. The Akkadian name, Nabû-kudurri-uṣur, means "O god Nabu, preserve/defend my firstborn son". Nabu, son of the god Marduk, is the Babylonian deity of wisdom. In an inscription, Nebuchadnezzar styles himself as Nabu's "beloved" and "favorite". His name has previously been mistakenly interpreted as "O Nabu, defend my kudurru", in which sense a kudurru is an inscribed stone deed of property. However, when contained in a ruler's title, kudurru approximates to "firstborn son" or "oldest son". Variations of the Hebrew form include נְבוּכַדְנֶאצַּר‎ and נְבוּכַדְרֶאצַּר‎ (Nəḇuḵaḏreṣṣar). He is also known as Bakhat Nasar, which means "winner of the fate", or literally, "fate winner". Nebuchadnezzar was the oldest son and successor of Nabopolassar, who delivered Babylon from its three centuries of vassalage to its fellow Mesopotamian state, Assyria, and in alliance with the Medes, Persians, Scythians, and Cimmerians, laid Nineveh in ruins. According to Berossus, some years before he became king of Babylon, Babylonian dynasties were united. There are conflicting accounts of Nitocris of Babylon being either his wife or daughter. Nabopolassar was intent on annexing the western provinces of Syria (ancient Aram) from Necho II (whose own dynasty had been installed as vassals of Assyria, and who was still hoping to help restore Assyrian power), and to this end dispatched his son westward with a large army. In the ensuing Battle of Carchemish in 605 BC, the Egyptian and Assyrian army was defeated and driven back, and the region of Syria and Phoenicia were brought under the control of Babylon. Nabopolassar died in August that year, and Nebuchadnezzar returned to Babylon to ascend the throne. 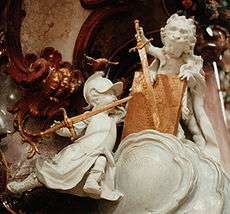 Nebuchadnezzar faces off against Zedekiah, the last king of Judah, who holds a plan of Jerusalem, in a Baroque era depiction in Zwiefalten Abbey, Germany. After the defeat of the Cimmerians and Scythians, previous allies in the defeat of Assyria, Nebuchadnezzar's expeditions were directed westward. The powerful Median empire lay to the north. Nebuchadnezzar's political marriage to Amytis of Media, the daughter of the Median king, had ensured peace between the two empires. Nebuchadnezzar engaged in several military campaigns designed to increase Babylonian influence in Aramea (modern Syria) and Judah. An attempted invasion of Egypt in 601 BC was met with setbacks, however, leading to numerous rebellions among the Phoenician and Canaanite states of the Levant, including Judah. Nebuchadnezzar soon dealt with these rebellions, capturing Jerusalem in 597 BC and deposing King Jehoiakim, then destroying the city in 587 BC due to rebellion, and deporting many of the prominent citizens along with a sizable portion of the Jewish population of Judea to Babylon. These events are described in the Prophets (Nevi'im) and Writings (Ketuvim), sections of the Hebrew Bible (in the books 2 Kings and Jeremiah, and 2 Chronicles, respectively). After the destruction of Jerusalem, Nebuchadnezzar engaged in a thirteen-year siege of Tyre (circa 586–573 BCE) which ended in a compromise, with the Tyrians accepting Babylonian authority. Following the pacification of the Phoenician state of Tyre, Nebuchadnezzar turned again to Egypt. A clay tablet, now in the British Museum, states: "In the 37th year of Nebuchadnezzar, king of the country of Babylon, he went to Mitzraim (Egypt) to wage war. Amasis, king of Egypt, collected [his army], and marched and spread abroad." Having completed the subjugation of Phoenicia, and a campaign against Egypt, Nebuchadnezzar set himself to rebuild and adorn the city of Babylon, and constructed canals, aqueducts, temples and reservoirs. According to Babylonian tradition, towards the end of his life, Nebuchadnezzar prophesied the impending ruin of the Chaldean Dynasty (Berossus and Abydenus in Eusebius, Praeparatio Evangelica, 9.41). He died in Babylon between the second and sixth months of the forty-third year of his reign, and was succeeded by Amel-Marduk. During the last century of Nineveh's existence, Babylon had been greatly devastated, not only at the hands of Sennacherib and Assurbanipal, but also as a result of Babylon's repeated rebellions. 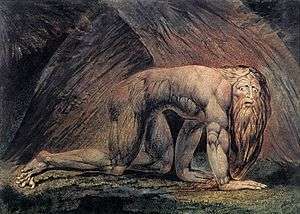 Nebuchadnezzar, continuing his father's work of reconstruction, aimed at making his capital one of the world's wonders. Old temples were restored; new edifices of incredible magnificence were erected to the many gods of the Babylonian pantheon (Diodorus of Sicily, 2.95; Herodotus, 1.183). To complete the royal palace begun by Nabopolassar, nothing was spared, neither "cedar-wood, nor bronze, gold, silver, rare and precious stones"; an underground passage and a stone bridge connected the two parts of the city separated by the Euphrates; the city itself was rendered impregnable by the construction of a triple line of walls. The bridge across the Euphrates is of particular interest, in that it was supported on asphalt covered brick piers that were streamlined to reduce the upstream resistance to flow, and the downstream turbulence that would otherwise undermine the foundations. Nebuchadnezzar's construction activity was not confined to the capital; he is credited with the restoration of the Lake of Sippar, the opening of a port on the Persian Gulf, and the building of the Median Wall between the Tigris and the Euphrates to protect the country against incursions from the north. These undertakings required a considerable number of laborers; an inscription at the great temple of Marduk suggests that the labouring force used for his public works was most likely made up of captives brought from various parts of western Asia. Nebuchadnezzar is credited by Berossus with the construction of the Hanging Gardens, for his homesick wife Amyitis (or Amytis) to remind her of her homeland, Medis (Media) in Persia. He is also credited for the construction of the Ishtar Gate, one of the eight gates leading into the city of Babylon. However, some scholars argue that the Gardens may have been constructed by the Assyrian king Sennacherib in his capital city, Nineveh. Nebuchadnezzar is widely known through his portrayal in the Bible, especially the Book of Daniel. 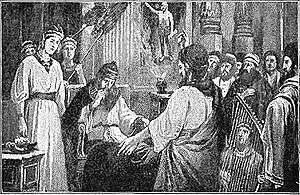 The Bible discusses events of his reign and his conquest of Jerusalem. Daniel 2 is attributed to the second year of Nebuchadnezzar's reign, in which Nebuchadnezzar is said to dream of a huge image made of various materials (gold, silver, bronze, iron and clay). The prophet Daniel tells him that God's interpretation is that it stands for the rise and fall of world powers, starting with Nebuchadnezzar's own as the golden head. In Daniel 3, Nebuchadnezzar erects a large idol made of gold for worship during a public ceremony on the plain of Dura. When three Hebrews, whose names were Hananiah, Mishael, and Azariah (respectively renamed Shadrach, Meshach, and Abednego by their captors, to facilitate their assimilation into Babylonian culture), refuse to take part, he has them cast into a fiery furnace. They are protected by what Nebuchadnezzar describes as "The son of God" (Daniel 3:25 KJV) and emerge unscathed without even the smell of smoke. Daniel 3 goes on to say that Nebuchadnezzar realized that no man-made god has the power to save and praised the God of Shadrach, Meshach, and Abednego. He then made a decree that anyone of any nation that would make any accusation against God would be mutilated and their homes be destroyed. In Daniel 4, Nebuchadnezzar dreams about an immense tree, which Daniel interprets to mean that Nebuchadnezzar will go insane for seven "times" (often interpreted as years) because of his pride. The chapter is written from the perspective of King Nebuchadnezzar. Daniel 4 concluded with Nebuchadnezzar losing his sanity and living in the wild like an animal for "seven times" (usually thought to be seven years) during his reign. After this, his sanity and position are restored. Theologians have interpreted this story in several ways. Origen attributed the metamorphosis as a representation of the fall of Lucifer, Bodin and Cluvier maintained it was a metamorphosis of both soul and body, Tertullian confined the transformation to the body only, without the loss of reason, cases of which Augustine stated were reported in Italy, but gave them little credit. Gaspard Peucer asserted that the transformation of men into wolves was common in Livonia. Some Jewish rabbis asserted there was an exchange of souls between the man and ox, while others argued for an apparent or docetic change which was not real. The most generally received opinion, which was also held by Jerome, was that the madman was under the influence of hypochondriachal monomania by which God could humble the pride of kings. Modern writers have speculated that the biblical story might refer to an illness with a natural organic cause. Some consider it to have been an attack of clinical lycanthropy or alternatively porphyria. Psychologist Henry Gleitman wrote that Nebuchadnezzar's insanity was a result of general paresis or paralytic dementia seen in advanced cases of syphilis. Some scholars think that Nebuchadnezzar's portrayal by Daniel is a mixture of traditions about Nebuchadnezzar and about Nabonidus (Nabuna'id) who became confused with him. For example, Nabonidus was the natural, or paternal father of Belshazzar, and the seven years of insanity could be related to Nabonidus' sojourn in Tayma in the desert. The Book of Jeremiah contains a prophecy about the arising of a "destroyer of nations", commonly regarded as a reference to Nebuchadnezzar (Jer. 4:7), as well as an account of Nebuchadnezzar's siege of Jerusalem and looting and destruction of the temple (Jer. 52). Chapter 14 of the Book of Isaiah refers to what Jewish exegesis of the prophetic vision of Isaiah 14:12–15 identifies as King Nebuchadnezzar II; the Hebrew text says הֵילֵל בֶּן-שָׁחַר (Helel ben Shaḥar, "day-star, son of the morning"). It is a taunting prophecy against an oppressive king. In Isaiah 14, the king is being mocked, as he is struck through with a sword, killed, and thrown into a common grave. Mainstream Christianity reads into this passage to the fall of Lucifer because verse 20 says that this king of Babylon will not be "joined with them [all the kings of the nations] in burial, because thou hast destroyed thy land, thou hast slain thy people; the seed of evil-doers shall not be named for ever", but rather be cast out of the grave, while "All the kings of the nations, all of them, sleep in glory, every one in his own house". "Helel ben Shaḥar" may refer to the Morning Star, but Isaiah gives no indication that Helel is a star. According to Tabari, Nebuchadnezzar, whose Persian name was Bukhtrashah, was of Persian descent, from the progeny of Jūdharz. Some believe he lived as long as 300 years. While much of what is written about Nebuchadnezzar depicts a ruthless warrior, some texts show a ruler who was concerned with both spiritual and moral issues in life and was seeking divine guidance. Nebuchadnezzar was seen as a strong, conquering force in Islamic texts and historical compilations, like Tabari. The Babylonian leader used force and destruction to grow an empire. He conquered kingdom after kingdom, including Phoenicia, Philistia, Judah, Ammon, Moab, Jerusalem, and more. The most notable events that Tabari’s collection focuses on is the destruction of Jerusalem. Voltaire interprets the legacy of Nebuchadnezzar and his relationship with Amasis in a short story entitled The White Bull. The opera Nabucco (1842) by Giuseppe Verdi. The Nabucco pipeline, a planned natural gas pipeline that will transport natural gas from Turkey to Austria, via Bulgaria, Romania, and Hungary. 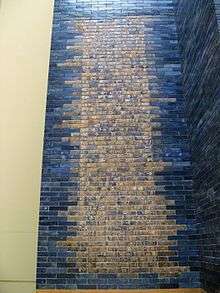 Saddam Hussein considered himself to be the reincarnation of Nebuchadnezzar and had the inscription "To King Nebuchadnezzar in the reign of Saddam Hussein" inscribed on bricks inserted into the walls of the ancient city of Babylon during a reconstruction project he initiated; he named one of his Republican Guards divisions after Nebuchadnezzar. A bottle of wine with a volume equivalent to 20 standard bottles (15 litres) is called a Nebuchadnezzar. "Nebuchadnezzar's Furnace" is a type of daylily. The name of Morpheus' vessel in the films The Matrix and The Matrix Reloaded. Nebuchadnezzar II is a playable character in Civilization V.
Nebuchadnezzar II is mentioned in the Microsoft computer game Age of Empires in the eighth Babylon campaign "Nineveh" in the history section and after the campaign is won. Nebuchadnezzar is a card in Magic: The Gathering. ↑ Flavius Josephus, Antiquities of the Jews, Book VIII, ch. 6–8. ↑ Ronald F. Youngblood; F. F. Bruce; R. K. Harrison, eds. (2012). Unlock the Bible: Keys to Exploring the Culture and Times. Thomas Nelson. p. 347. ISBN 1418547263. ↑ Allen, Leslie C. (2008). Jeremiah: A Commentary. Westminster John Knox Press. p. 472. ISBN 978-0664222239. ↑ Elgood, Percival George. 1951. Later Dynasties of Egypt. Oxford: Basil Blackwell, p. 106. ↑ Smith, William and Fuller, J.M. 1893. A Dictionary of the Bible: Comprising Its Antiquities, Biography, Geography, and Natural History. London: John Murray, vol. I, p. 314. ↑ Foster, Karen Polinger (1998). http://environment.yale.edu/documents/downloads/0-9/103foster.pdf |url= missing title (help) (PDF). Transformations of Middle Eastern Natural Environments: Legacies and Lessons. New Haven: Yale University. pp. 320–329. Retrieved 2007-08-11. ↑ Rollinger, Robert (2013). "Berossos and the Monuments". In Haubold, Johannes; et al. The World of Berossos. Harrassowitz. p. 155. ISBN 978-3-447-06728-7. ↑ "Son of God or a Son of the Gods (Daniel 3:25)?". kjvonly.org. Retrieved 17 January 2015. ↑ "Daniel 3:28-29". Bible Gateway. Retrieved 17 January 2015. ↑ "Blue Letter Bible—Strongs H5732". ↑ "Daniel 4". Bible Gateway. Retrieved 17 January 2015. ↑ Kroeger, Catherine Clark; Evans, Mary J. (2009). The Women's Study Bible: New Living Translation (Second ed.). Oxford University Press. ISBN 978-0-19-529125-4. ↑ Henry Gleitman, Psychology (New York: W W Norton, 2007), 219. ↑ Wolfram von Soden: "Eine babylonische Volksüberlieferung von Nabonid in den Danielerzählungen". In: Zeitschrift für die alttestamentliche Wissenschaft 53 (1935), pp. 81–89. ↑ Calvin's Bible Commentaries: Jeremiah and Lamentations, Part I, John Calvin, translated by John King, Forgotten Books, 2007, p. 168. ↑ "ASTRONOMY – Helel, Son of the Morning.". The unedited full-text of the 1906 Jewish Encyclopedia. JewishEncyclopedia.com. Retrieved 1 July 2012. ↑ Wilken, Robert (2007). Isaiah: Interpreted by Early Christian and Medieval Commentators. Grand Rapids MI: Wm Eerdmans Publishing. p. 171. ISBN 978-0-8028-2581-0. ↑ Gunkel, "Schöpfung und Chaos," pp. 132 et seq. ↑ "Isaiah Chapter 14". mechon-mamre.org. The Mamre Institute. Retrieved 29 December 2014. 1 2 Ṭabarī, Muḥammad Ibn-Ǧarīr Aṭ- (1987). The History of Al-Tabarī. State Univ. of New York Pr. pp. 43–70. ↑ Wiseman, D.J. (1985). Nebuchadrezzar and Babylon. Oxford. ↑ Tabouis, G.R. (1931). Nebuchadnezzar. Whittlesey House. p. 3. ↑ Encyclopedia of the Developing World, edited by Thomas M. Leonard, p. 793. ↑ Archeology Under Dictatorship, Michael L. Galaty and Charles Watkinson, p. 203. ↑ "Nebuchadnezzar (Masters Edition III) - Gatherer - Magic: The Gathering". wizards.com. Retrieved 17 January 2015. Arnold, Bill T. (2005). Who Were the Babylonians?. BRILL. Freedman, David Noel (2000). "Nebuchadnezzar". In Freedman, David Noel; Myers, Allen C. Eerdmans Dictionary of the Bible. Eerdmans. Lee, Wayne E. (2011). Warfare and Culture in World History. NYU Press. Wiseman, D.J. (1991a). "Babylonia 605-539 BC". In Boardman, John; Edwards, I. E. S. The Cambridge Ancient History, Volume III Part II. Cambridge University Press. Wiseman, D.J. (1991b). Nebuchadrezzar and Babylon: The Schweich Lectures of The British Academy 1983. OUP/British Academy. This article incorporates text from a publication now in the public domain: Easton, Matthew George (1897). "Nebuchadnezzar". Easton's Bible Dictionary (New and revised ed.). T. Nelson and Sons. This article incorporates text from a publication now in the public domain: Herbermann, Charles, ed. (1913). "Nabuchodonosor". Catholic Encyclopedia. New York: Robert Appleton. Wikisource has the text of the 1879 American Cyclopædia article Nebuchadnezzar.